A solid wooden frame door for a more traditional Spanish rustic looking kitchen. 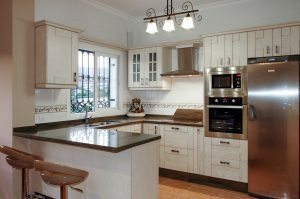 Here it is often mixed with both small and big framed doors, combined with granite worktops. Rustic on the outside, but 20th century modern storage on the inside for optimized storage and functionality. This design combines perfectly with steel appliances.